The Yak fund is coming along nicely. So far I’ve earned 100K gold playing the auction house over the last 3 weeks. Only 20K to go. I should have plenty of funding when MoP goes live. Interestingly uncut green gems are selling pretty well and making more money than transmuting them to blue and then cutting them. That seems odd to me, but it’s working. In the beta I have been working on faction reps waiting for the next patch to come out. I SO hope that pet battles will be enabled. I also hope that the Jade Forest is back and that the materials for the scribe staves are available. 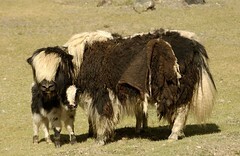 I just remembered it’s not just the Grand Expedition Yak. There’re the turtle mounts, the serpent mounts, the cat mounts from the Shado-pan and finally the Jewelcrafting mounts. Also rare mounts on the Black Market AH. I foresee a lot of time on the AH from now on.